Karen Guthrie is an Assistant Vice President at Bentall Kennedy. 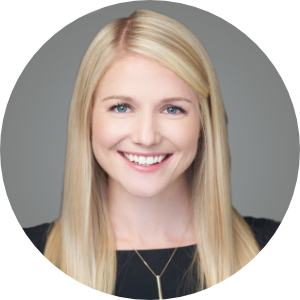 She joined in 2015 and is responsible for sourcing transaction opportunities in Chicago, Denver, Dallas, Houston, and Austin. Karen provides support and leadership for sourcing, underwriting, due diligence, and closing to over $1.5 billion in acquisitions and developments. Prior to joining Bentall Kennedy, Ms. Guthrie was a program manager for the U.S. General Services Administration in Washington, DC. Karen managed an integrated project team and led the acquisition of various IT goods and services on behalf of select U.S. Federal agencies. Karen holds an MBA in Real Estate from the University of Wisconsin-Madison and a BS in Economics and Business Administration from the University of Richmond. At the University of Richmond, Ms. Guthrie was a Division I athlete competing in cross-country and track and field. Karen is a member of the Urban Land Institute-Young Leaders, the Wisconsin Real Estate Alumni Association, and NAIOP, and was recently named an honoree in Connect Media’s 2018 Next Generation Awards. Karen is an avid Washington Capitals fan and Bravo aficionado.